Game 1 – Thu., May 12 – Binghamton at Charlotte, 7:05 p.m.
Game 2 – Fri., May 13 – Binghamton at Charlotte, 7:05 p.m.
Game 3 – Tue., May 17 – Charlotte at Binghamton, 7:05 p.m.
Game 4 – Wed., May 18 – Charlotte at Binghamton, 7:05 p.m. The Sens will have had almost a full week off by game 1. Hopefully a couple more regular d-men will be ready to go by then. Isn't that the Leafers Tender? Yup. This is his 3rd AHL team since leaving the Leafs organization. I got a tweet the other day saying a couple of the regular D-men who were wounded were practising again. Should be good if they can get all thier regulars back. I believe I heard that Gryba could start this series, back in the line-up. Could Da Costa be airlifted in when France is done at the Worlds? I don't think so, because he isn't on the "clear day roster" (I think that's what it's called) that had to be submitted before he was even signed by Ottawa. And here's hoping classmate enjoys the game!!! I'm also cheering for the Bulldogs in the other series. Hamilton is close enough (a little more than an hours drive) that I can get tickets and watch the Sens play for the Calder Cup. Going to games in Hamilton is a Senators jersey should make me very popular in Copps Coliseum. Great start with a 7-4 road win. It was 5-4 at one point so it was closer than it sounds. 1-0!!!! I hope Bingo makes it to the finals. Yeah...but how often do you see a goalie pulled (Lehner) when the team has the lead? I couldn't listen to it but it sounded like he was pretty shaky. Brust finished off the game after Lehner let in (I think) three goals on 12 shots. The opposing goalie was pulled also. Either way, great for the guys to get the win! I'm impressed with the way the coach has handled the goalie situation. Pulls him during the intermission and puts him back in nets for game 2. Hopefully Paddock and Hartsburgh are watching... they might learn a thing or two. Actually, I am impressed with this coach, Kleinendorst (sp?) on a lot of scores. Whenever I hear him interviewed, I like what I hear. Seems like a pretty focused guy but personable at the same time. In terms of Lehner, as far as his development (and that ultimately is why he is with Binghamton), it would appear to me that he is getting a good grounding of how to handle a lot of different situations and that's a good thing, IMHO. And Bingo beats Checkers again. Lehner with the shutout. Potulny with 2 goals. A league leading 13 goals in 15 games so far. 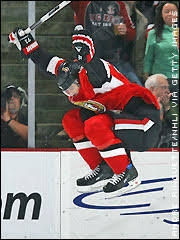 I am very impressed with the B-sens, What a great run they are having. And that's 8 road wins in a row - league record is 9. Listened to a lot of the 2nd period on the radio, and some of the 3rd and it sure sounded like the Sens were in complete control of the game. Pretty outstanding. Love to get to Bingo for a game but don't think I will be able to pull it off... this round.